I got the message below on bbm yesteday and it obviously reached the Federal Government as they have issued statement refuting the claim that the First Lady, Patience Jonathan did not delay the landing of Dana Air plane which later crashed. "Is there any way of getting confirmation about news I'm just getting that the Dana plane was distressed for a while but could not make an emergency landing because the airspace was closed for 2 hours for the Presidential Jet carrying Dame Patience Goodluck Jonathan. Private jet owners who had to hover in the air same time leaked this. This was apparently the reason local news didn't report the crash for so long till CNN and foreign news stations started reporting it. Local news was 'blacked out' trying to kill the story of the airspace being closed while a distressed plane couldn't land. It would be shocking if so. Though there was engine failure there was still time for the plane to have landed apparently. You do know anyway that the airspace is closed for up to 2hours each time the Presidential Jet needs to go into the air? 2 hours for a 15minute take off or landing! And this jet is used by President, VP, President's wife and if I recall, David Mark. It's almost a daily occurrence I've been told by airline staff when it caught me out on a trip. The truth remains that the President's wife was actually in Lagos to attend the christening of their personal assistant's child at the Oriental hotel, Lekki. Anyone living on the Lekki axis saw first hand the horrendous traffic caused by the president's wife's visit and confirmed reports from airport staff who volunteered information, collaborated this fact, that the Lagos airport was actually shut for 2 hours, about the same time the ill fated Dana Plane crashed. This also strongly explains the reason why Aero contractor airplane could not depart Abuja for Lagos at 3:40pm because of the closure of the Lagos airport. A statement by the Special Assistant (Media) to the Minister of Aviation, Mr. Joe Obi, said the airspace was never closed for the First Lady on Sunday. He said, “There is a widely circulating rumour that the airspace was closed to facilitate the First Lady’s movement and that that was partly responsible for the Dana plane crash of Sunday June 3, 2012. The Federal Ministry of Aviation will like to clarify that nothing could be farther from the truth. An air traffic controller at the Lagos airport, who spoke under condition of anonymity, also said the airport did not record any Presidential movement on Sunday. According to the official, an air traffic controller on duty on Sunday had told him earlier there was no time the “airfield was sterilised” for any VIP on Sunday. In a statement by her Special Assistant, Mr. Ayo Osinlu, the wife of the president described the report as an orchestrated plan to politicise the Sunday crash. 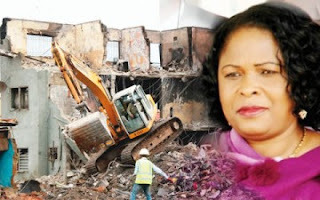 She said it was “callous, inhuman and devilish” for anyone to have thought of wrapping such national calamity in political garb by insinuating that the plane crashed because the airspace was closed for her movement in Lagos. “In compliance with her itinerary, the First Lady arrived Lagos on Saturday. She was at a public event on Sunday when the accident occurred and promptly abandoned the ceremony as a mark of respect for the victims and retired to the State House, Marina. She left Lagos at exactly 13.15hrs on Monday, 4th June, 2012, according to schedule. “It is therefore surprising that some mischievous persons will see this moment of national mourning as an opportunity to blackmail and impugn the First Lady’s integrity. “This is the time for all Nigerians to be sober and pray for the repose of the souls of the victims and not a time to subordinate the interests of our nation to narrow self-serving interests. The message which necessitated Mrs. Jonathan’s reaction had read in part, “Is there any way of getting confirmation about news I’m just getting that the Dana plane was distressed for a while but could not make an emergency landing because the airspace was closed for 2 hours for – the Presidential Jet carrying Dame Patience Goodluck Jonathan. “Private jet owners who had to hover in the air same time leaked this. This was apparently the reason local news didn’t report the crash for so long till CNN and foreign news stations started reporting it. A source however said, “It would be shocking if so. Though there was engine failure, there was still time for the plane to have landed apparently. - Statement and pic obtained from Punch.